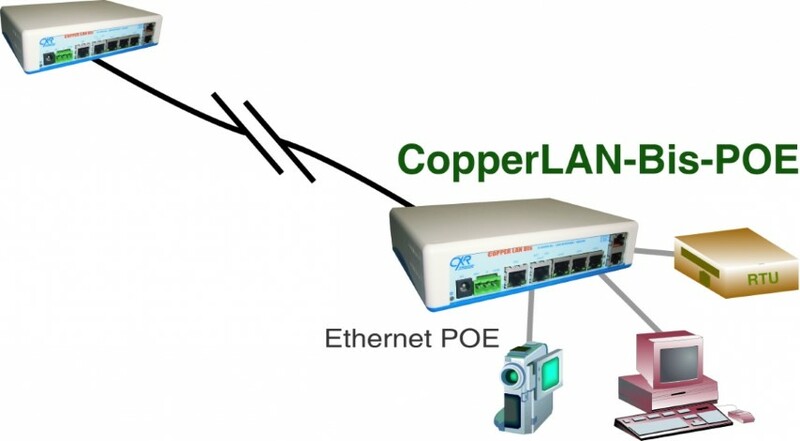 CopperLan-Bis delivers high speed Ethernet services over one or two copper pairs according to the ITU-T G.SHDSL.Bis / G.991.2 or IEEE 802.3ah Ethernet First Mile standards. Its 15 Mbps per pair speed and Ethernet protocols for VLAN, Provider Brdge (Q-in-Q) and QoS, help Service Providers and the industry to operate High Speed Symmetrical Ethernet services over very long distance on existing copper lines. Performance is up to 15 Mbps per pair on 0.4 mm / AWG26 copper lines, or distance is up to 8 km at 384 kbps, or 12 km on 0.9 mm wire gauge. CopperLan-Bis embeds a 4 ports wire speed Ethernet switch. One port supplies a 15 W POE source to feed a video camera, an IP phone, etc. An asynchronous terminal such as a RTU, a Point Of Sales terminal, another equipment console port, etc. can connect to the network through the RS232 port of the CopperLan-Bis. CopperLan-Bis comes as a compact product with a choice of mains and 24/48 Vdc power inputs, and DIN rail or 19'' mounting options.